Do you have any idea who the maker of the dishes are? I’m in CA and a little to far to stop by and purchase them! I’m totally in love with those dishes! I also love the double napkin idea. Beautiful table! It is a lovely place setting. Some day I’d like to be able to set a table like that. 🙂 Although with little kids right now it could be quite a challenge. I am in love with those hydrangea dishes! A pretty table is as good as chocolate or any sugar high! ha! That platter is simply stunning. thank you for stopping by to see me this evening. Do come again. Oh I love those hydrangea plates. That table is so pretty! I would love to own a shop like that..but it is far away! Very lovely table, and what fun to do it in a shop with so much to pick from! 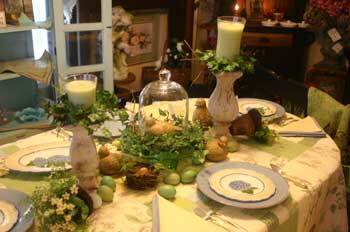 Beautiful table, I love the greenery as well, thank-you for dropping by!!! What a lovely spring tablescape – the hydrangea plates really steal the show! Oh what fun to set a table in a store like this! I love it…Happy TT to you! Wonderful and fried green tomatoes too! How pretty! I just LOVE those hydrangea plates! 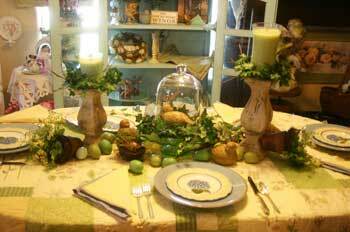 Would you consider creating your version of the floating tablescape and netering it in the contest? I know you would do something beautiful! The setting is lovely with the quilt and the hydrangea plates. The Cottage website has very enticing merchandise. Love these dishes….the table looks fabulous. 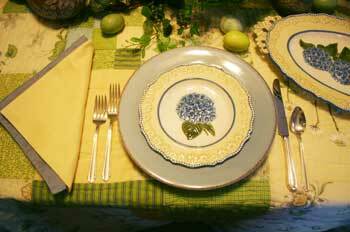 Gorgeous dishes, yellow and that monet shade of blue, oh la la, I love it. A girl after my own heart! Gardening! Joy! I wanted to see the cloche centerpiece close up, but I couldn’t get my computer to enlarge it. Shucks! I love this. 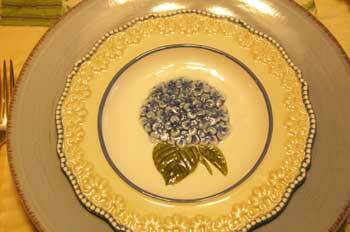 And hydrangea dishes and platters. Oh my! this is beautiful, I may have to have a look at these in person when we come to visit. Thanks for sharing your shopping trip….great inspiration. Looks already delicious to me ! Beautiful !! Love the combinations of the colors and those dishes are to die for ! Two napkins – great idea ! Christi.. It’s perfect.. So beautiful! The quilt looks like it was made just for that dinnerware. Love it! I love everything; The dishes are beautiful and what a gorgeous tablescape you made using them. Thanks for sharing. nice dishes and nice table! Thanks for sharing this lovely table. So cute! 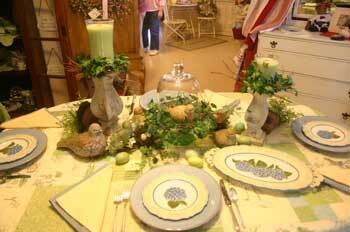 Love the dishes – and the only thing better than tablescaping is tablescaping with a friend – what fun! Love the dishes!!!! You’ll have to tell us who makes them! Blue and yellow is one of my favorite combinations–very pretty! those are gorgeous dishes, the quilt is the perfect background for them! 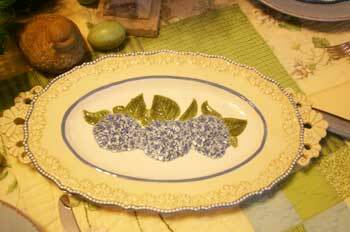 I love hydrangeas and those dishes are beautiful! Lovely colors and the candlesticks are so pretty! 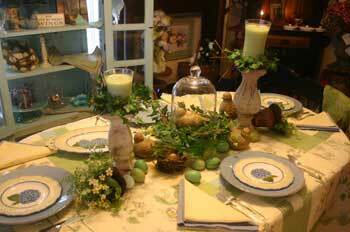 I would love to be able to set tablescapes like this at my house because that is beautiful! I am undermined in my plans by kids and cats. Plus, is there anything better than fried green tomatoes?